Gale force winds once again caused the cancellation of racing in the Royal Cork Yacht Clubs annual Frostbite Dinghy League. 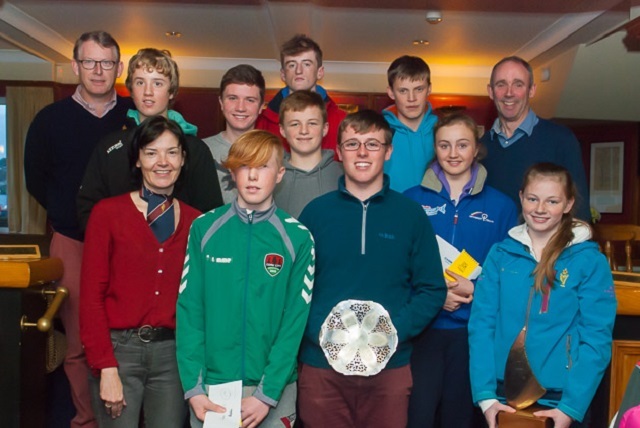 The event was curtailed to 2 days racing (six races) in total instead of the planned 5 days (and 15 races), all thanks to Storms ‘Abigail’, ‘Barney’ and ‘Clodagh’. A pity, but the 6 races that took place were very competitive. The Frostbite was first started in 1975 by the fledging Laser Standard Rig fleet. Legend sailor David Gay was the first winner. Other famous sailing names are mentioned on the Cork Silver platter since that time, for example, Vere Ludgate, Mark Mansfield, Mick Wallace, Nick Walsh, Maurice O Connell, Peter O Leary to name but a few. This year the Topper fleet joined the league to race for the ‘Bill Jones’ memorial trophy. With racing already cancelled for Sunday, the prize-giving took place in the club house last Saturday afternoon. Rear Admiral Dinghies was on hand to present the prizes. 1st Jennifer O Shaughnessy. 2nd Sophie Crosbie. 3rd Oisin MacAllister. 1st Chris Bateman. 2nd Paddy Cunnane. 3rd Tom Keal. 1st Jamie Tingle. 2nd = Ronan Walsh. 3rd = Eoghan O Regan. Front row L to R: Rear Admiral Celine McGrath, Chris Bateman winner Laser 4.7, Jamie Tingle winner Laser Radial, Jennifer O Shaughnessy winner Topper fleet. Middle row L to R: Tom Keal, Oisin McAllister, Sophie Crosbie. Back row L to R: Brian Jones (Topper Class Captain), Eoghan o Regan, Ronan Walsh, Paddy Cunnane, Paul Tingle (Laser Class Captain).